Does Failing to Provide Candidate Feedback Harm Your Business? According to the 2012 Candidate Experience survey by Gerry Crispin of over 100 American companies, about 79.1 percent of unsuccessful job applicants do not receive feedback from employers and only 9 percent receive what could be considered useful and more detailed feedback. So, the general consensus amongst employers is that providing feedback to candidates is generally not a priority during the hiring process. But, is it right that candidate feedback should in most cases be neglected? Does it matter? Is there any benefit to the employer in providing feedback; and is there a chance that failing to provide feedback could be harming your employer brand and business? I think there is strong chance that a failure to provide feedback can damage your business. For example, in the first instance, providing detailed feedback to candidates lets them know their personal strengths and weakness for the role and your business, meaning that the more conscientious and committed can direct their learning so that they may soon become appropriately qualified for your company. This means that an influential employer has the power to groom unsuccessful applicants, by providing targeted developmental feedback, into ideal candidates who may be more suitable candidates in the future. What’s also important to consider is just how “viral” your treatment of your candidates will become, whether positive or negative. Because, if you create goodwill by being reactive and providing feedback, you should know that 83 percent of people will tell their friends and family about the experience and 64 percent spread the word by social media, according to a mysteryapplicant.com survey. And since research tells us that the most influential form of talent attraction at the moment is word-of-mouth hiring and not job boards, building a great candidate experience by providing feedback is a great way to boost your talent attraction process as candidates will tell the world that your company seems to treat its workers well. Of course, failing to provide feedback will seriously harm your talent attract processes as 37 percent of candidates who have a poor candidate experience wouldn’t recommend the company to other people, which will seriously detract from your word-of-mouth hiring initiatives. 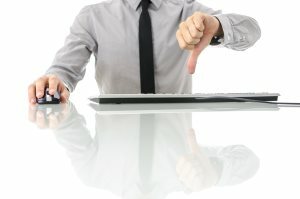 And we should be clear that failure to provide candidate feedback is one of the main reasons that candidates deem their interview experience to be poor, as shown by a Careerbuilder survey, which revealed 44 percent of workers who didn’t hear back from an employer when they applied for a job said they have a worse opinion of that employer. As well as this, both the Careerbuilder study and mysteryapplicant study show that a bad applicant experience makes candidate much less likely to buy products from that employer. So, a failure to provide feedback (a key part of a strong candidate experience), could weaken both your employer brand and company brand and land you in hot water with the marketing department. Of course, lawyers might advise you to avoid giving feedback as you leave yourself open to legal action, but equally employees who have been placated by receiving feedback are also likely to feel goodwill towards your company, which will make them less likely to make a vexatious legal claim against you. I personally come down on the side of it being a net positive to provide feedback.